Yoga has been practiced for over 4,000 years. It originated in India as a means of attaining self-awareness, and became a component of the Ayurveda system of health. The word “yoga” means “to yoke” or “union” as it unites the body and the mind. Fitness was not even a thought in the early traditions of yoga, but the practice’s popularity in the US has largely focused on its ability to challenge and shape the body. Yoga is characterized by postures (asanas), breathing (pranayama) and meditation. The most common form in the US is Hatha yoga. But, there are many different styles of yoga that fall under the heading of Hatha yoga (Iyengar, Viniyoga, Ashtanga, Kundalini, Bikram, Kripalu, Integral). There are many medical conditions that benefit from yoga as evidenced by numerous clinical trials. These include asthma, cardiovascular disease, diabetes, headaches, hypertension, mental disorders, osteoarthritis, pain, rheumatoid arthritis, and stress. Studies have also shown that those who practice yoga tend to have better nutrition habits, as they seem to have more respect and awareness of the needs of their body. Yoga is completed in bare feet, generally on a sticky mat. Yoga is not intended to be competitive or straining. Yogic breathing is done through the nose. It is a deep form of belly breathing in which the throat is hollowed out (Ujjayi breathing). Yoga Nidra Meditations – www.yoganidranetwork.org/downloads – free downloads of Yoga Nidra scripts for a relaxing, meditative form of yoga that is helpful for sleep. Mind Body Solutions – mindbodysolutions.org – an organization aimed at bringing yoga to those with physical challenges. 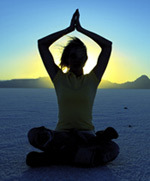 Yoga Journal – www.yogajournal.com – this is an excellent resource for all things yoga. They have videos and indexes of yoga poses which are especially helpful. Sara Invanhoe’s Yoga Body Makeover – I LOVE this set of videos. Sara instructs at a slow, encouraging pace, yet each workout really tones the entire body. There are 6 workouts (5 are just 20 minutes which is the perfect amount of time for me) on 2 discs making this a great value. 10 Minute Solution Yoga (with Lara Hudson) – if you are short on time, this video is a great option. There are 5 routines to choose from and a really great interactive feature that lets you build your own workout combining the different routines. Yoga for Everyone (Hemalayaa) – This disc offers two 20 minute workouts that are really uplifting. They also incorporate chanting making them a more authentic yoga experience beyond just exercise. YogaWorks – Beginners AM/PM – This is a great option if you are just learning yoga, the instruction is thorough, and it goes at a nice pace. YogaWorks – Body Slim – I pop in this 50 minute DVD when I really want to get toned. I find it very challenging, but totally doable, and when I finish I feel great. Again the instruction from YogaWorks is very good. Dr Bhaswati Bhattacharya. Lecture at The Graduate Institute (April 29 & April 30, 2011). Understanding Ayurvedic Medicine Using a Biomedical Model.